Arsene Wenger has reached the lowest point in his 16-year reign as Arsenal manager, according to Emmanuel Petit. But the former Gunner believes it would be the "biggest mistake" to sack Wenger who he says is "still the solution". Wenger's side look set to finish without a trophy for a seventh season running and face a fight to qualify for next season's Champions League. "This is the worst moment of Arsene's career with Arsenal," the ex-midfielder told BBC Sport. Meanwhile, ex-Arsenal boss George Graham said the club were in crisis. Arsenal were beaten at Sunderland in the FA Cup on Saturday, which followed Wednesday's Champions League thrashing by AC Milan. 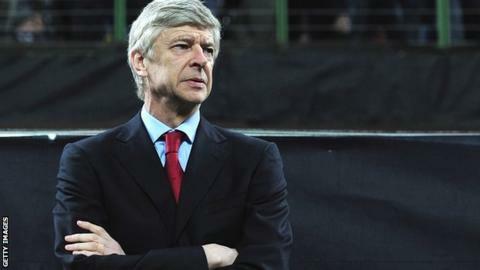 They sit fourth in the Premier League, 17 points behind leaders Manchester City, and there is growing speculation that Wenger could leave in the summer. "That would be the biggest mistake," said Petit who was part of the 1997-98 Arsenal team that won the Premier League and FA Cup Double in Wenger's first full season in charge. They lifted five more trophies in the next seven years, with the 2005 FA Cup their most recent piece of silverware. "Arsene is still the solution. The players have to look in the mirror, be honest and ask questions of themselves," added Petit who played under fellow Frenchman Wenger at Monaco and Arsenal. "They are playing like they don't know what's going on, they don't know what to do on the pitch. Mentally, they are very weak." Petit traces Arsenal's current problems back to 2011's Carling Cup final loss to Birmingham and wants Wenger to change his philosophy. "Birmingham was the crucial point," explained 1998 World Cup-winner Petit. "From then on, the players started to lose confidence in the policy at Arsenal. "Arsene built success based on experienced players and big characters. All of a sudden he decided to completely change it, put confidence in young players. "For five years they were close to winning something but they didn't and that's why they have to change the policy. "They have to bring in more experience and big characters. They need leaders. But you cannot sign big players if you are not in the Champions League." Petit is particularly critical of Arsenal's transfer activity last summer. The season had already started by the time they sold Cesc Fabregas to Barcelona and Samir Nasri to Manchester City, while five players were signed in the final 48 hours of the window. "How they managed that was terrible," the 41-year-old added. "Nothing was controlled. Everything was done so quickly without thinking. "Every year they're selling their best players. Arsenal are not a football academy - they're one of the biggest clubs in Europe and need to get back to that level. "They have to spend money to get the big names, and they must also ask some players to leave." Meanwhile, Graham claimed the board would be starting to harbour doubts over Wenger, but added that any decision over his future would lie with the man himself. "I think he will be there next season but he badly needs to refresh the playing side," said Graham, who managed the club between 1986 and 1995. "They've got money to spend and I can't understand why Arsene did not go out and buy some real quality players last summer." The Scot predicted captain Robin van Persie would leave at the end of the season and suggested winger Theo Walcott should be sold.